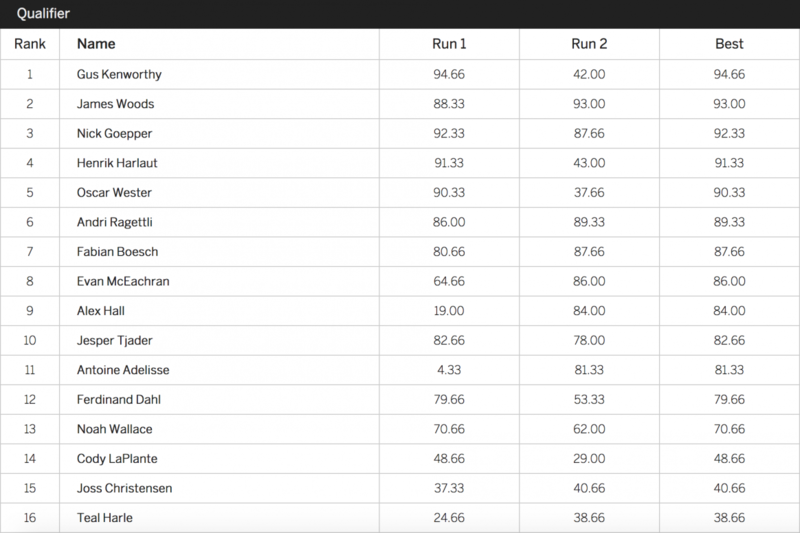 It wasn’t easy today to be a judge in the qualifying round of the 2018 X Games Men’s Ski Slopestyle contest in Aspen, Colorado, as sixteen top slopestyle skiers (with a stunning total of 32 X Games medals among them) duked it out for a precious five spots in the finals. When the smoke cleared, Gus Kenworthy led the pack with a top score of 94.66, followed by James Woods, Nick Goepper, Henrik Harlaut and Oscar Wester. 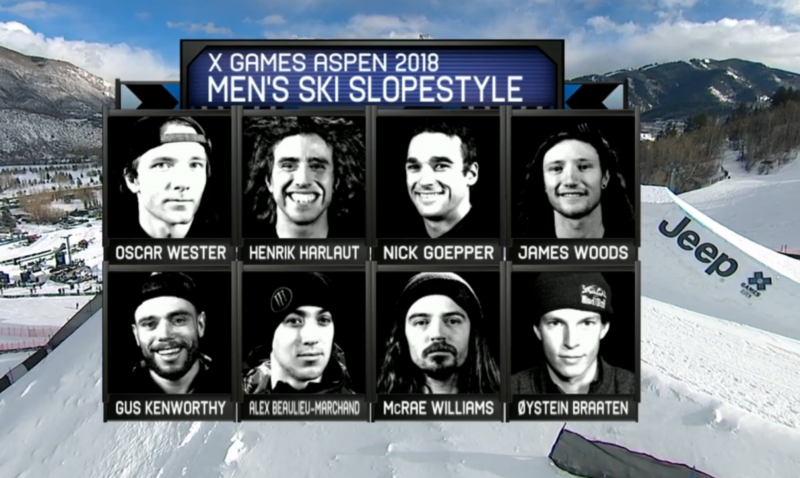 These five skiers will join the three pre-qualified medalists from last year’s X Games slopestyle—Alex Beaulieu-Marchand, McRae Williams and Øystein Bråten—in the finals on Sunday. With a fairly stock, albeit perfectly executed run through the jumps (left double cork 1080 blunt, right double cork 1260 mute on the side hit and switch left double cork 1080 japan), Kenworthy’s high-scoring run was marked mostly by his technical spin-to-win strategy in the rail section: a whirlwind left 270 on, 450 out of the first rail followed immediately by a right 270, continuing 270, switch left 270 to backside 360 swap on the flat-down rail and a switch right tails 270, continuing 270 on the last down rail—all four 270s on, for those who were paying attention. Missing the cut by just one point was Andri Ragettli in sixth place, who unpacked a massive triple cork 1620 safety on the final jump, but suffered in comparison with relatively stock tricks in the rail section. Needless to say, if a stomped run including a triple 1620 wasn’t good enough for the finals, the level of competition today was freakin’ really high. A light snowfall overnight created some speed problems in the rail section, which proved crucial for some competitors like 15-year-old Cody LaPlante, who simply couldn’t find speed through the rails. Others as well found their X Games dreams stymied by the speed in the rails, which complicated trick execution throughout the contest. Some trick highlights included Henrik Harlaut’s rightside disaster 450 on to 450 out on the flat-down rail, a trick he learned during practice; Alex Hall’s highly creative rail section including a fastslide, back 270 out and a 270 on, 270 out with a tail tap, not to mention his beautiful double cork 1260 safety to tailgrab on the side hit of the second jump; and Ragettli’s aforementioned triple 1620. The X Games Men’s Ski Slopestyle finals go down on Sunday, January 28 at 12:45PM MT (8:45PM CET). The women’s Ski Slopestyle finals (no qualifiers for the ladies) will be held on Saturday, January 27 at 11:00AM MT (7:00PM CET). Viewing is possible using the ESPN Player, and free livestreams appear to be working as well—we’ll keep you updated. Men's Ski Slopestyle qualifying results. The eight men's ski slopestyle finalists. This should be good. Review : The Bunch’s Finito is the end of an era – or is it the beginning?